The Apache, who called themselves, depending on dialect, the Nnēē:, Ndee, or Indé ("People"), were not members of a single tribe but instead divided into a vast constellation of independent groups spread across an enormous area. 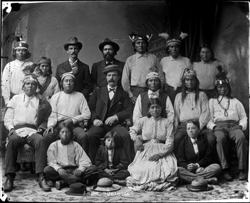 Some Apachean peoples, such as the Kiowa or Plains Apache, could be found as far east as the Great Plains, but the most important groups in the Arizona-Sonora borderlands were the Western Apache, who lived in the mountains to the north and east of Tucson, and the Chiricahua Apache, who dwelled in the mountains to Tucson's southeast. Unlike the surrounding O'odham, who spoke a language in the Ute-Aztecan family, the Apaches' were members of the Na-Déné or Athapaskan linguistic family. As most forms of Na-Déné are to be found in northern North America, it is hypothesized that at some point the ancestors of the borderland's present-day Athapaskan speakers migrated into the region. But when this may have occurred remains controversial. Because of the paucity of Apache artifacts in the archaeological record and the limited mention of the Apache in early Spanish documents, some scholars have tended to place this migration sometime in the 1500s. Many Apaches, however, point out that such absences may instead indicate the endurance of long-standing Apache customs of self-preservation: erasing all traces of their campgrounds and avoiding potentially dangerous intruders. The Western Apache were divided into over twenty distinct bands, each with its own independent leader. These bands often took their names from the areas where they lived. The two Apache bands in the closest contact with the inhabitants of Tucson, for example, called themselves the Tsé hiné ("Black Rocks People") and the T'iisibaan ("Cottonwoods in Gray Wedge Shape People"). To many Mexicans and Americans, however, all were Apaches no matter their band, while to the O'odham, the they were simply the 'O:b or "Enemy." Although the Apache were members of an oral culture that produced few written documents, outsiders who came into contact with them compiled a number of revealing records related to Apache perspectives on the events in the borderlands. In addition, by the turn of the century, as more Apaches became more familiar with English, increasing numbers of them wrote or dictated documents in this new language.